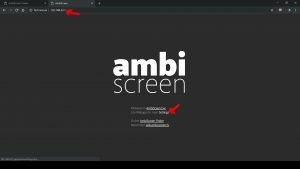 There are two ways how to setup your AmbiScreen. Simple way is as access point. More advanced way is for home wifi network. Both will be described below (images are clickable). This is the easiest way and the most convenient. WiFiLED will be connected to Eye’s access point wifi network. 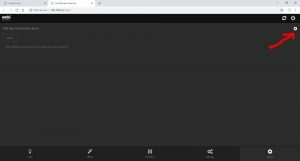 This will work when there are no wifi credentials stored in Eye (if you have stored home wifi credentials in your Eye device previously, go to Eye’s wifi settings and reactivate default wifi AP or reset device). If your home wifi network is slow or you have many devices in it, you can see lag or flashing LEDs from time to time – in this case your best bet is to set “AmbiScreen as Access Point” as described here. Note: WiFiLED device boots within few seconds. But Eye boots in 1-2 minutes, so it can be visible in accessible wifi networks list in 1-2 minutes after boot. Eye needs to be fully booted before WiFiLED can connect to Eye’s wifi access point. Turn on power on both Eye and WiFiLED. In web browser (e.g. 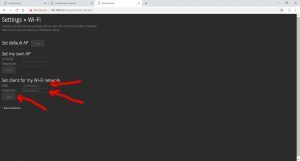 Google Chrome) navigate to http://192.168.33.1. Then click on last Settings Tab (down right) and insert network name (e.g. AmbiScreenEye_1A1A6DF2 but in your case last characters will be different according to step 2) and password “ambiscreen33” (without quotes). Click on Save&Reboot. Once rebooted, unplug WiFiLED from power, wait 5 seconds and plug to power again. Then go Settings – LEDs and in field WifiLED IP insert IP from step 4 (in our case 192.168.33.16, in your case it can be different). You can customize other Led settings on this page, too. Then click on save and your Eye and WiFiLED will be synchronized from now. 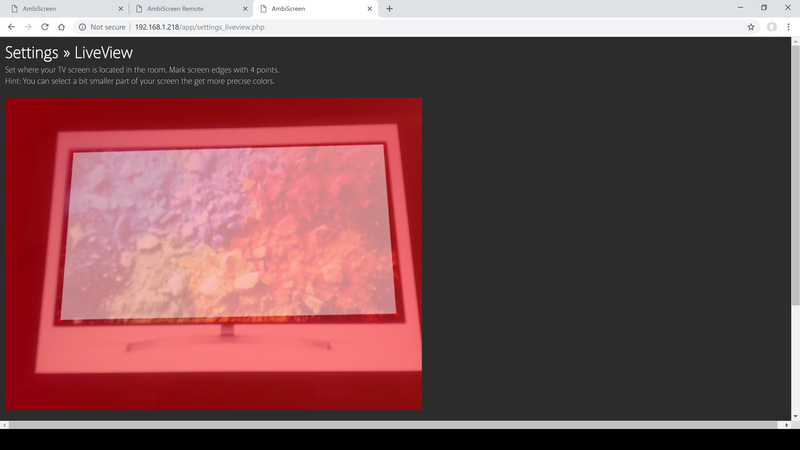 When you save LEDs settings navigate to Settings – LiveView and setup 4 edges of your TV screen on picture. Click save. Alternatively you can use Finder to locate your Eye device, but in this setup it will have always IP 192.168.33.1. In this setup Finder will not locate WiFiLED as single device, because Eye is master device for this case. If you want to use Finder, you need to connect to your home wifi first, then open http://finder.ambiscreen.tv in browser, then connect to Eye network and click on Detect button. Done! Now you can use web app to control colors, effects, settings, … of your Eye. 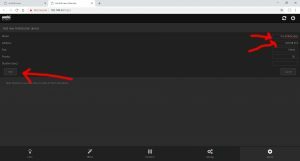 Note: If your home wifi network is slow or you have many devices in it, you can see lag or flashing LEDs from time to time – in this case your best bet is to set “AmbiScreen as Access Point” as described above. Note 2: For successful detection Finder needs to be opened on the device (phone, laptop, tablet,…) in the same network as Eye and WiFiLED – it means you need to open Finder on device (e.g. computer, phone, …) which is connected to internet first (in your home wifi network) and then switch to Eye’s wifi access point so now you are in the same network as Eye and WiFiLED. 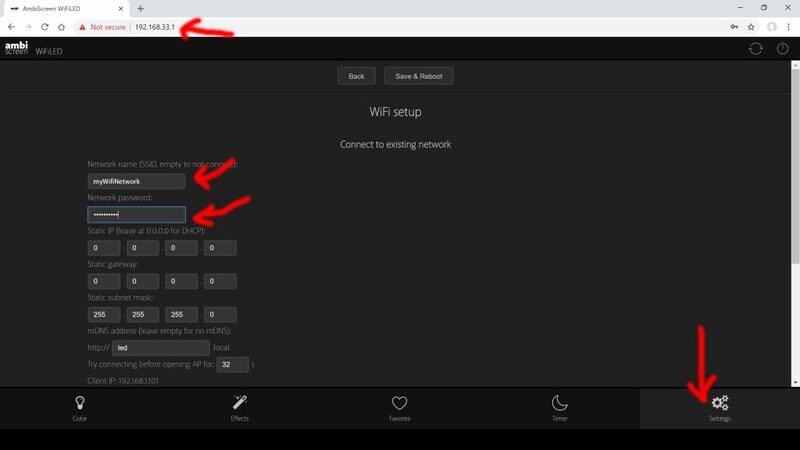 This setup is for advanced users as it may require additional knowledge because your home wifi network can have specific setup. 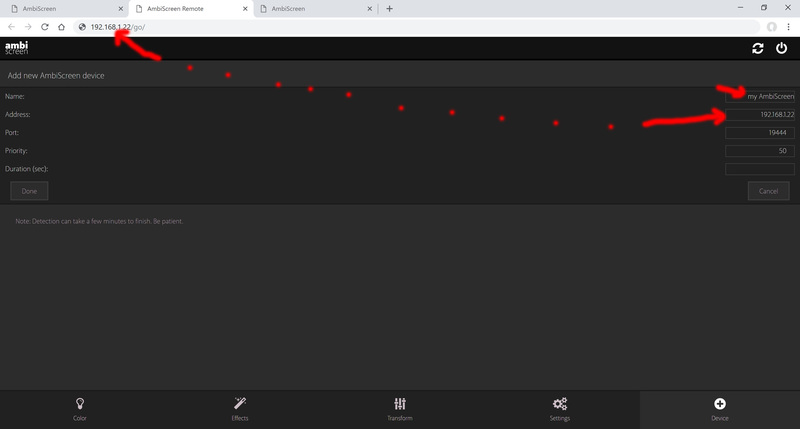 Note 1: If your home wifi network is slow or you have many devices in it, you can see lag or flashing LEDs from time to time – in this case your best bet is to set “AmbiScreen as Access Point” as described above. Note 2: If you have wifi connection issues check that your wifi network is 2.4GHz only, it has short alphanumeric wifi network name without special characters (like e.g.apostrophes). Important: WiFiLED device boots within few seconds. But Eye boots in 1-2 minutes, so it can be visible in accessible wifi networks list in 1-2 minutes after boot. In web browser (e.g. Google Chrome) navigate to http://192.168.33.1. Then click on last Settings Tab (down right) and insert your home network name (e.g. myWifiNetwork) and password “ambiscreen33” (without quotes). Click on Save&Reboot. Once rebooted, unplug WiFiLED from power, wait 5 seconds and plug to power again. Navigate to Settings – WiFi and insert you wifi name, password and click Save. 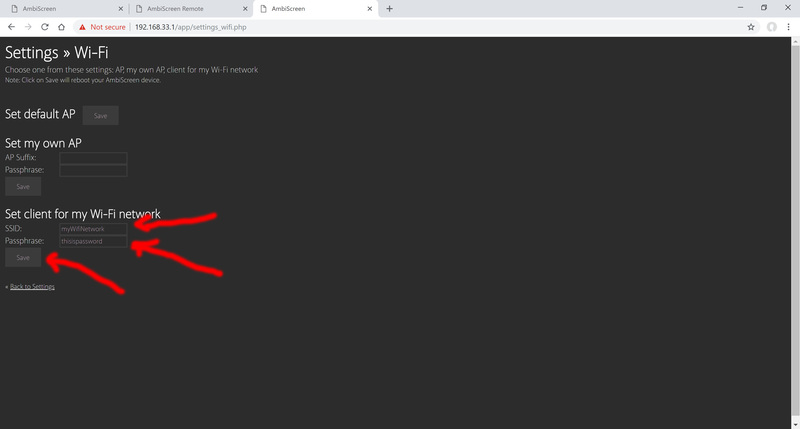 Now Eye will reboot (on the page there will be timeout message after a while in browser window – this is correct) and after new boot Eye tries to connect to your wifi network. If your Eye does not reboot you can unplug it from power and plug it to power again. 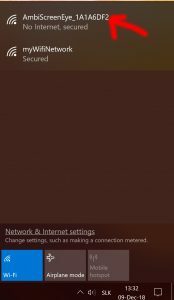 Note: This settings will turn off internal wifi AP on Eye so you will not see it in wifi networks broadcast list anymore (as in step 5). This is difference between Eye and WiFiLED, where Eye is not visible in network list with this setup but WiFiLED is visible continuously. If you don’t see internal AP, it does not mean that Eye is connected to your home wifi for 100%. If you want to know it for 100%, you can check it in your router (DHCP table list). If there is any problem, you can revert to default settings and access point by reseting device (e.g. if your router blocks connection for Eye, you filled in bad wifi name or password). Eye boot session takes 1-2 minutes. Now you can use Finder (http://finder.ambiscreen.tv) to locate your Eye device and WiFiLED with Detect button. Once Finder locates your devices, click on Eye for the next setup. Click on “Lite webapp for main Settings”. Then go Settings – LEDs and in field WifiLED IP insert IP from step 4 (in our case 192.168.1.108, in your case it can be different). 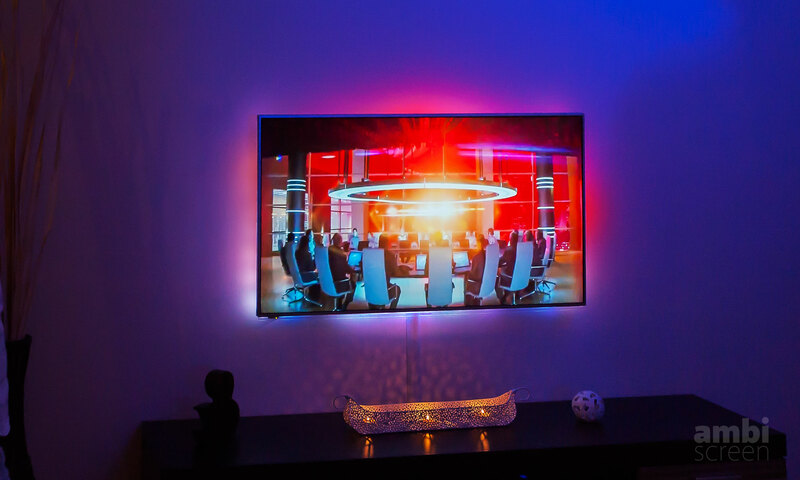 You can customize other Led settings on this page, too. Then click on save. Done! At this step Eye and WiFiLED should be connected and synced together. 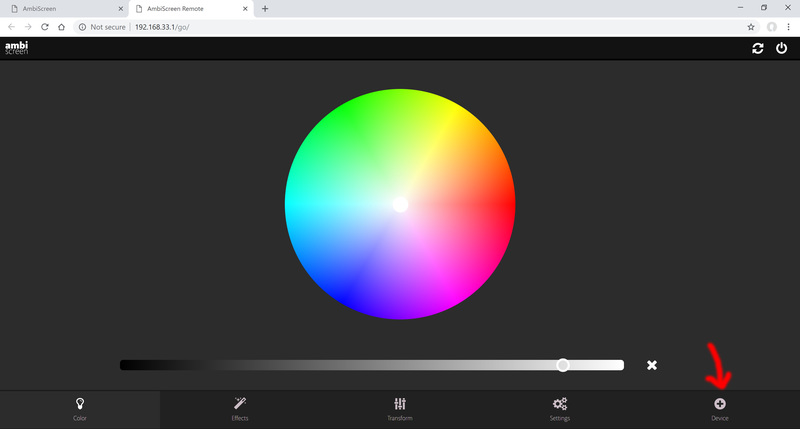 Now you can use web app to control colors, effects, settings, … of your Eye. Note 1: When Eye controls WiFiLED, it means that Eye is master and you will not be able to control WiFiLED directly (you must use Eye to control it). 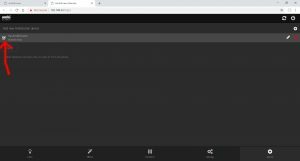 Note 2: If your home wifi network is slow or you have many devices in it, you can see lag or flashing LEDs from time to time – in this case your best bet is to set “AmbiScreen as Access Point” as described above. Note 3: Finder needs to be opened on the device (phone, laptop, tablet,…) in the same network as Eye and WiFiLED – it means you need to open Finder on device (e.g. phone) which is connected to the same network as Eye and WiFiLED. Is your device loosing wifi connection? Try to place your Eye device closer to your router. After first start AmbiScreen Eye opens its own wifi access point. 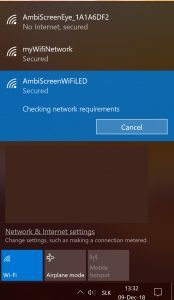 Connect to this “AmbiScreenWiFiLED” wi-fi network with password “ambiscreen33”. 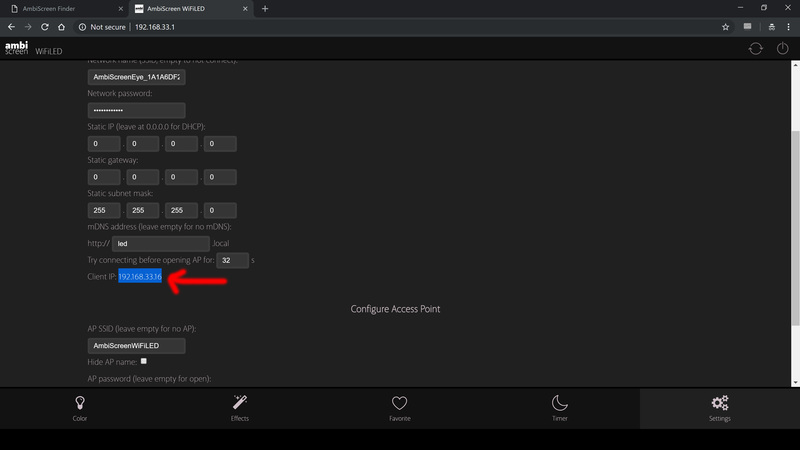 Navigate to http://192.168.33.1 via your web browser and setup your AmbiScreen Eye device via Settings page (count of LEDs, credentials for your home wi-fi ). When you set your own wifi credentials for your home wifi click on Save. It is recommended to manually unplug device from power for 30 seconds and then power it again. If device is not able to connect to your home wifi, repeat this step or check wifi credentials. After initial value change power-cycling is recommended. 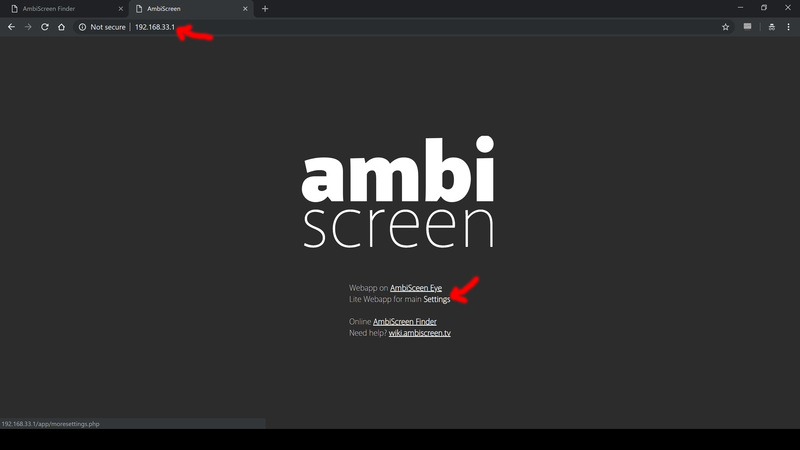 Via Finder you can click on AmbiScreen devices and it shows you internal web app of WiFiLED (you can also navigate to it directly via IP in web browser the same way), or internal web app of Eye. 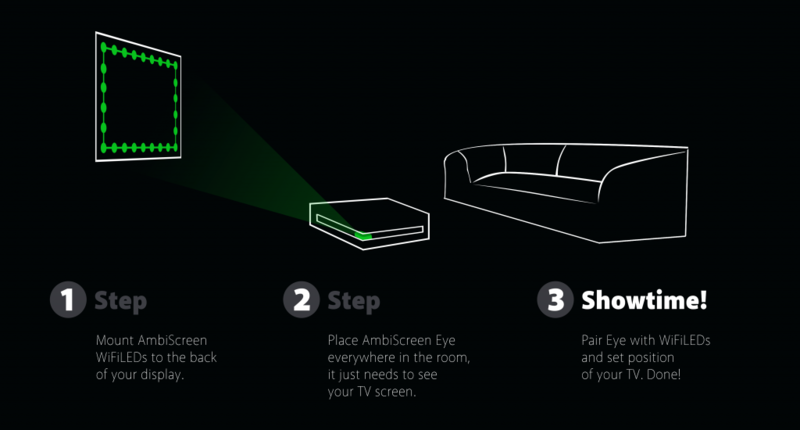 AmbiScreen Eye can be placed everywhere in the room. However, the best viewing experience is possible when Eye is placed in the right direction with screen. The best performance is in the dark room without light reflections. 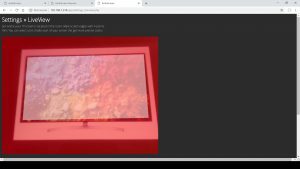 Reflections from your screen can affect generated colors. It is standard physical behavior and not fault of Eye. Many values of AmbiScreen Eye can be set. You can experiment with color values, speed values, frequency (update frequency and time will slow or speed up generated colors), etc. When e.g. Frequency is set too high, it can make your network inaccessible. In this case you can reset factory defaults of your device. Ambient daylight in the room can have an impact on live camera mode colors. This is standard physical behavior and not the reason for claim or returning the product. To minimize daylight you can boost color power with higher HSV color gain setting. Many color settings can be adjusted via web app live, or saved to standard settings. 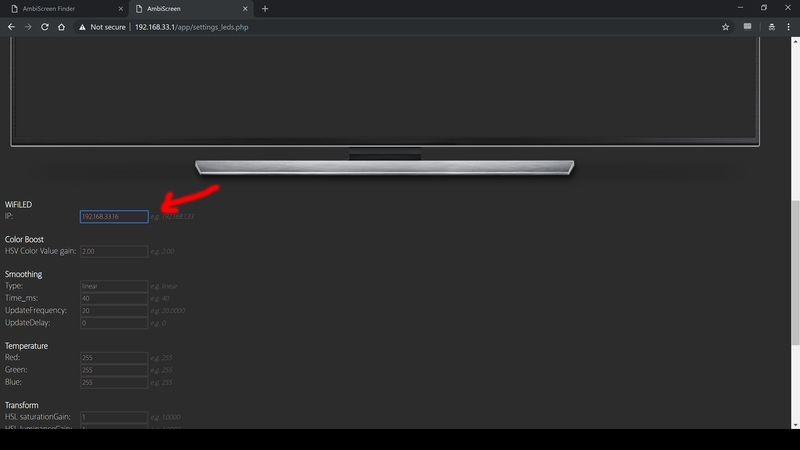 You can adjust colors on Transform tab and save it in Settings->LEDs. By default, color boosting is activated with value 2.0. You can deactivate it or adjust it at LEDs setting page („HSV Color Value gain“ to 1.0 deactivates it). Color boosting is advantage during daylight. No boosting can be achieved with value 1.0. Color boosting means that colors will be boosted to show greater effect (it can boost specific colors too much, e.g. white to blueish, and similar). 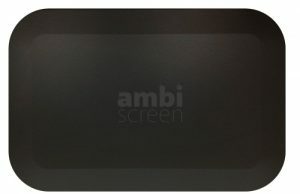 AmbiScreen Eye contains also Lite web app. This is good for tweaking or when your Eye device is not accessible via standard web app (e.g. when some setting was corrupted). Lite web app is available by accessing IP of Eye directly via web browser. 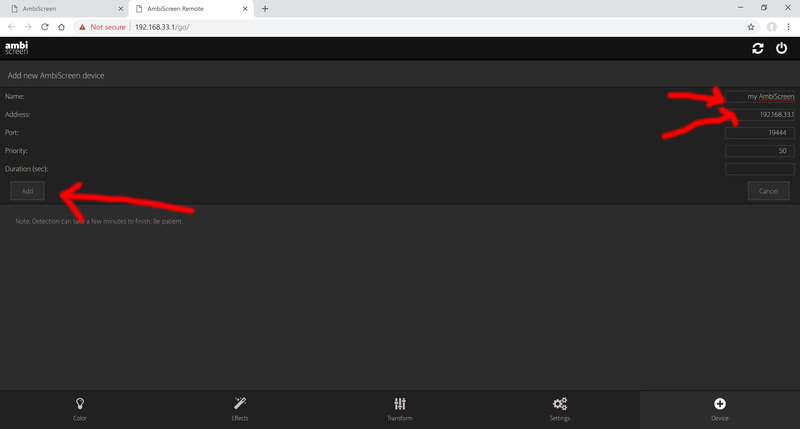 When in web app connection with your Eye is lost (red information message), click on Color tab or Device tab and device and connection should be initiated again. In package you can find small rubber cylinder. It can be used to adjust position of your AmbiScreen Eye device (you can replace standard legs with it to adjust the best position of Eye. Please use scissors to adjust leg length.). When electricity is lost in your home, manual uplug of AmbiScreen Eye and WiFiLED is recommended. 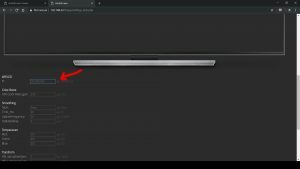 Eye and WiFiLED can automatically reboot when used for longer time. This feature is fully automatical for perfomring maintenance. 1. 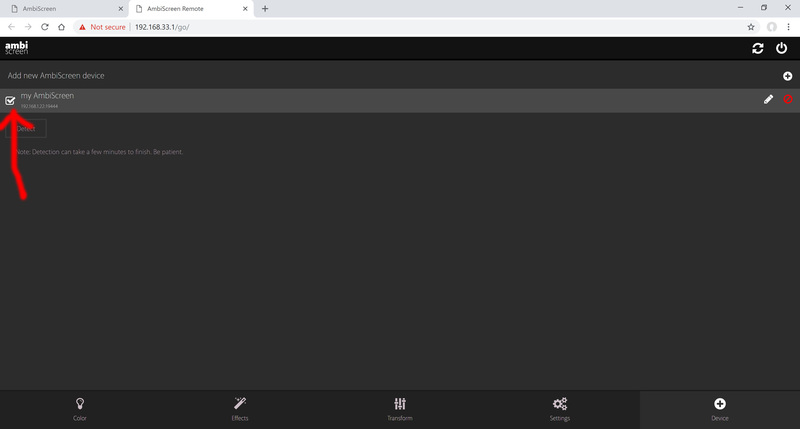 Partial reset of several settings via web app. 2. Full factory reset: When AmbiScreen Eye is plugged to power after approx. 40 seconds red LED on the back of device is turned on for window of 5 seconds. If you unplug power during this window (e.g. 1-2 seconds when red led is on) and then plug in power again, factory defaults will be recovered on the boot. (IMPORTANT: when turning off device from power always remove from device microusb cable at connector side of device – that is the back side of device). 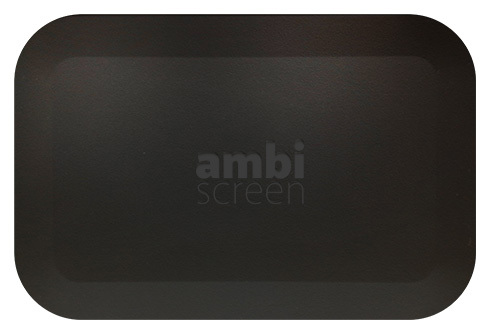 Put AmbiScreen Eye in the room on the place where the camera on the Eye has full view to the screen of your display. You can adjust live view via web app in Settings->LiveView. Just select 4 edges of your screen on the image and click on Save button. Optimal Eye distance is ~2.5m away from screen but you can even place it everywhere in the room with greater distance.